Berry Pomeroy castle is situated in an isolated part of Devon near to the small village of Berry Pomeroy. One of the ghosts is known as the White Lady and she haunts the dungeons, rising from St. Margaret's Tower to the castle ramparts. The castle was built during the early 12th century on land that was presented to Ralph de Pomeroy by the King of England, William the Conqueror, as a reward for his loyalty and support during the Norman invasion of England. 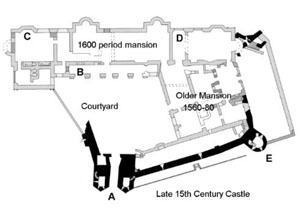 The castle was home to the Pomeroy family for nearly 500 years after the Norman conquest.The lands were forfeited in 1549 when Thomas Pomeroy took part in a religious rebellion. The castle passed to Sir Edward Seymour, who built a mansion within the walls of the Norman castle. The castle was ravaged during the Civil War (Oliver Cromwell's Roundheads Vs the Cavaliers who fought for Royalty) and was further damaged by fire in the early 18th century, after which no one has wanted to live their due to it's dark history. It is now reported to be one of the most haunted buildings in the United Kingdom. One of the ghosts is known as the White Lady. She haunts the dungeons, and rises from St. Margaret's Tower to the castle ramparts. Those who report seeing this figure associate it with feelings of depression, fear and malevolence. She has been identified as the ghost of Lady Margaret Pomeroy who was imprisoned in the dungeons by her sister, Lady Eleanor. Eleanor was insanely jealous of her younger and prettier sister, and is said to have incarcerated her because of a love rivalry, after Lord Pomeroy left to go on a crusade and left Eleanor in charge. Margaret was imprisoned in the castle dungeons for nearly two decades, before Eleanor allowed her a slow and painful death through starvation. A blue light has been seen on a particular day every year in St Margaret's Tower, usually during the evening. The blue light has been witnessed by many people in the past including Peter Underwood and his colleagues during an overnight investigation some years ago. A second ghost is the Blue Lady, she has been reported there as far back as the 18th century. Dressed in a long blue cape and hood it has been claimed that she tries to lure men to their death by seeking help in unsafe areas of the castle. Said to be the spirit of the daughter of an early Norman lord, who after an incestuous relationship with her father, she gave birth to a child. Shortly after it's birth, her father strangled the baby in one of the upper rooms of the tower. In another version of the story it is said that she hated the child so much that she strangled it herself. It is said that because she smothered her child, her troubled spirit can find no rest, and she is often seen wringing her hands in anguish. At various times, the cries of the murdered infant can be heard throughout the castle. 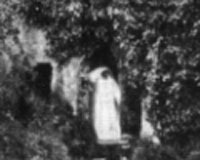 The photo above was taken in the early 1900's with the image of a ghost in the doorway of the gatehouse, while the castle was still encased in Ivy, before English Heritage took management. The figure appears to be of a woman in a long dress. It's thought that it could be the Blue Lady. Sir Walter Farquhar was a witness to the Blue Lady in the late 18th century. He was a prominent doctor of the time and was in the castle attending to the wife of a steward who had fallen ill. He saw "a stunning young woman, who was wringing her hands in obvious distress," and he watched the figure move up a stairway and into a room upstairs. With no prior knowledge of the legends of the Blue Lady he asked the steward who the figure was. Showing signs of considerable distress, the steward explained that the appearance of the figure was an omen of death. He thought that this meant that his wife would die. The doctor dismissed the idea, and confirmed that the woman was recovering well. But in fact the steward was rightly concerned, his wife suddenly died later that day. 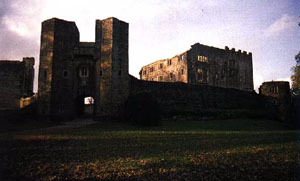 Modern investigations in Berry Pomeroy Castle has resulted in many reports of apparitions, shadows, photographic failure, paranormal sounds and more. It has been documented that some visitors to the castle who have taken a small memento, such as a small stone etc., have quickly returned it as they feel that part of the foreboding and lingering feel of evil has followed them home.